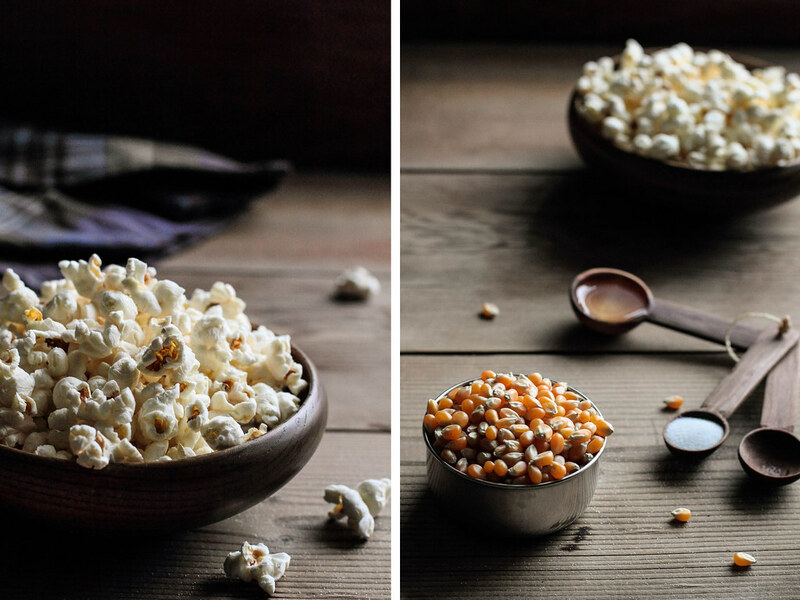 Stove Top Popcorn has become a new staple in my kitchen this fall. After years of buying microwave popcorn, it took a bag of gifted popcorn kernels and a broken microwave to get me to turn to the stove. Though it was a last resort at the time, it is now my first choice when it comes to popping corn. Honestly, I don't know why it took me so long to discover the pleasure of stove top popcorn. Popping popcorn on the stove is simple, takes about the same length of time as the microwave, and the taste is incomparable. When I was younger, visiting my grandparents on an overnight trip, my grandmother pulled out her largest soup pot to cook up a batch of popcorn. It was the first time I had watched someone make popcorn on the stove and I found the process utterly fascinating. 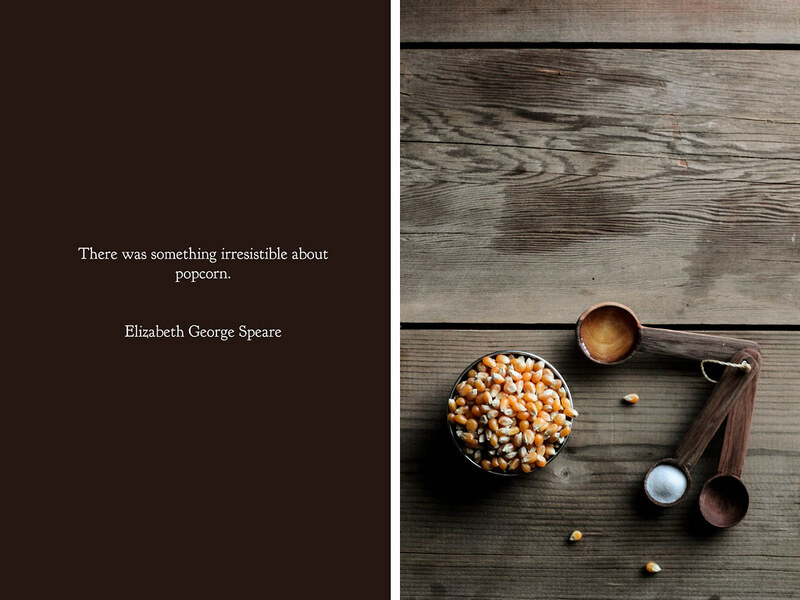 The sputtering oil, the explosions of kernels, the unmistakably scent filling the air—there was something magical about it. Perhaps that childhood "magic" is what carries over as we grow older. Though the science teacher in me could describe the scientific principles involved at length, theory never quite matches experiment. I still find wonder in cooking up a batch of stove top popcorn, delighting in each experience as if it were my first. 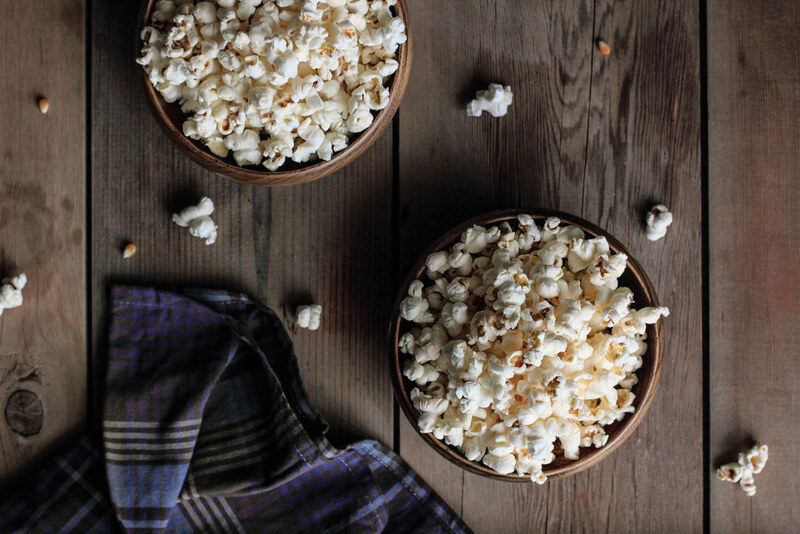 In the winter months, when the world is cold and the glow of television feels warm, popcorn is a regular on the menu, often composing late night snacks and the occasional meal. 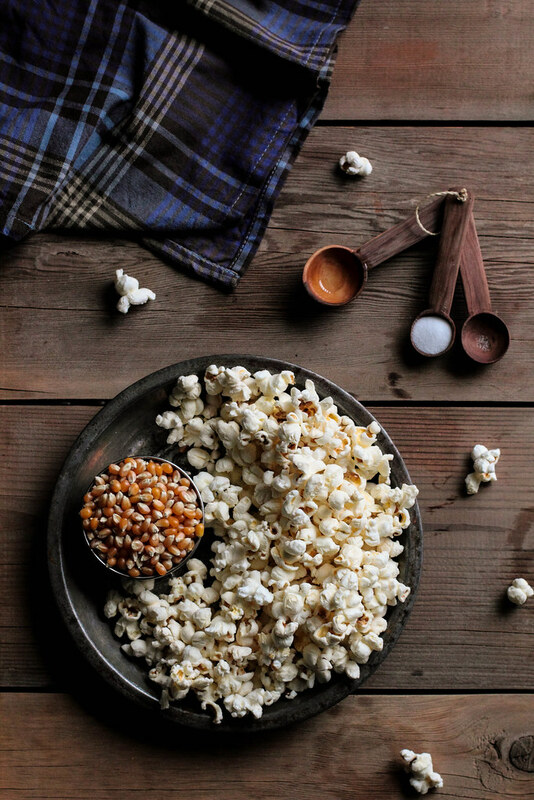 While microwave popcorn can leave a waxy, unpleasant taste in my mouth when I near the end of the bag, stove top popcorn is never too greasy and is easy to customize. The recipe I've shared with you is as basic as it comes. You can dress it up with melted butter and spices or, if you are a popcorn purist like me, leave it plain and enjoy it just the same. 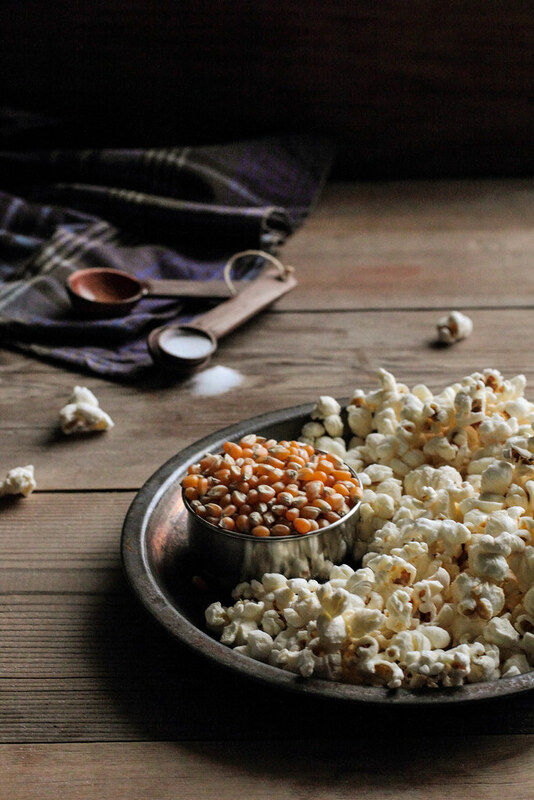 Stove Top Popcorn can be made in 3-4 minutes with only three ingredients. 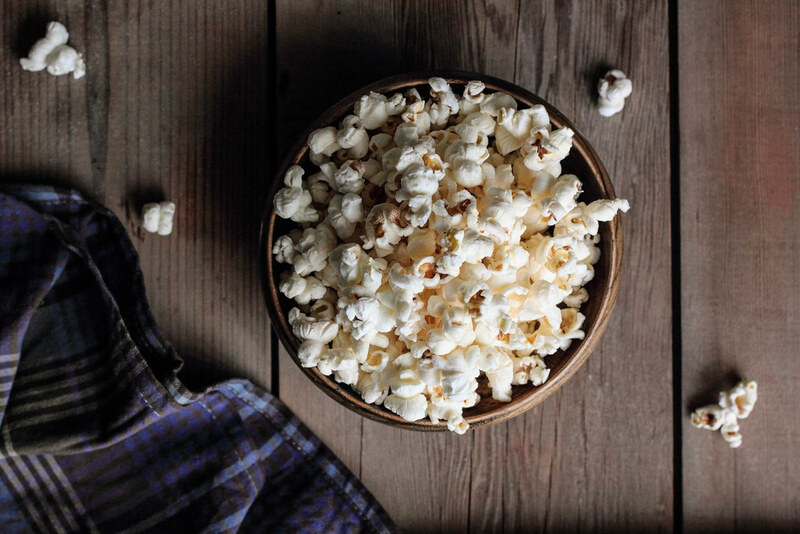 Popcorn kernels, a neutral oil, and a little salt are all you need for perfect popcorn. The oil is heated on the stove, the popcorn is added, and the heat is removed to allow all kernels to reach the same temperature. Once the pot is put back on the stove, the kernels pop quickly. In the dozen of batches I have made, I have never encountered more than 3-4 un-popped kernels. This recipe is easy and produces easily customizable results. When I first decided to become a baker, I was convinced I would love cake decorating. I had a small artistic streak and fostered a passion for arts and crafts. Cake decorating seemed like the perfect mesh of my interests and hobbies, as if it was meant to be. I was in love with the idea before I even tried it. My first real job in the field was baking the cakes in a small bakery specializing in its namesake, with the hopes of one day becoming a decorator myself. I took local cake decorating courses in the evenings, trying to become proficient in the tricks of the trade. After many long evenings filled with lopsided roses, uneven borders, cracked fondant, and frustrated tears, I was no longer convinced I would love—or even like—cake decorating. In fact, I was sincerely positive I never wanted to lay eyes on a flower made of frosting again. I put my simple dreams of becoming a decorator to rest, tucking them in a box to be forgotten under the bed. Though disappointed, my love for baking had not wavered. It was time to point my heart in a different direction. 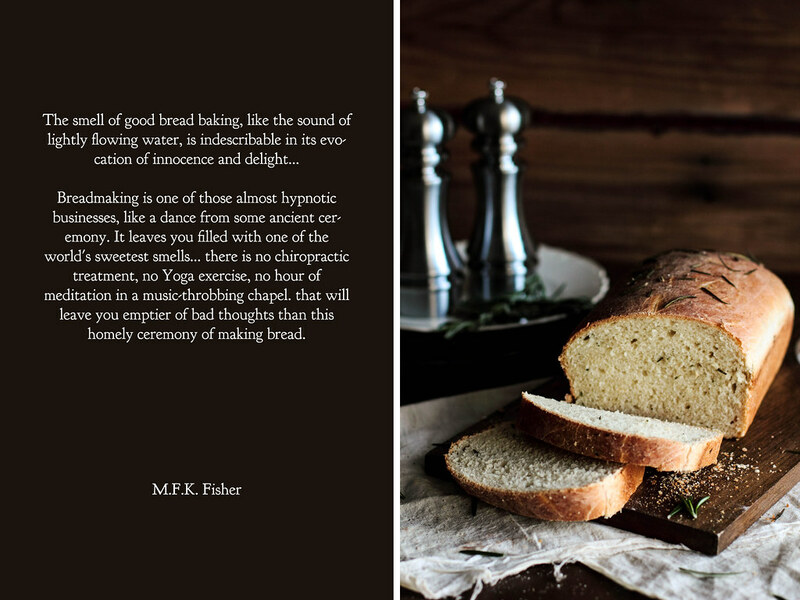 When I started baking breads for another bakery, my first impression left me with a cynical view and a sour attitude. The dough was ever sticky and my shoulders ached from kneading and rolling out dozens of bagels and rolls. I had a difficult time seeing the joy in the process. As the days passed, however, my perspective slowly began to evolve. I began to understand the dough, feeling the subtle changes in its texture as I kneaded it beneath my fingertips. My hands learned to conform to the character of the dough when I rolled it into various shapes. The musky scent of yeast punctuated these intimate moments, which quickly became my most beloved of all my tasks. The dough was alive, truly alive, filled with the life my buttercream roses could only pretend to possess. Though I never anticipated it, I was smitten, enamored with the process from beginning to end. Even as I bake in my small apartment kitchen today, I can only allow a few weeks to pass before the itch to rediscover yeast surfaces. Last weekend was one such instance. I bought a bundle of fresh rosemary on a whim and, still dreaming of this focaccia, I knew that the rosemary was destined to get together with a little yeast. 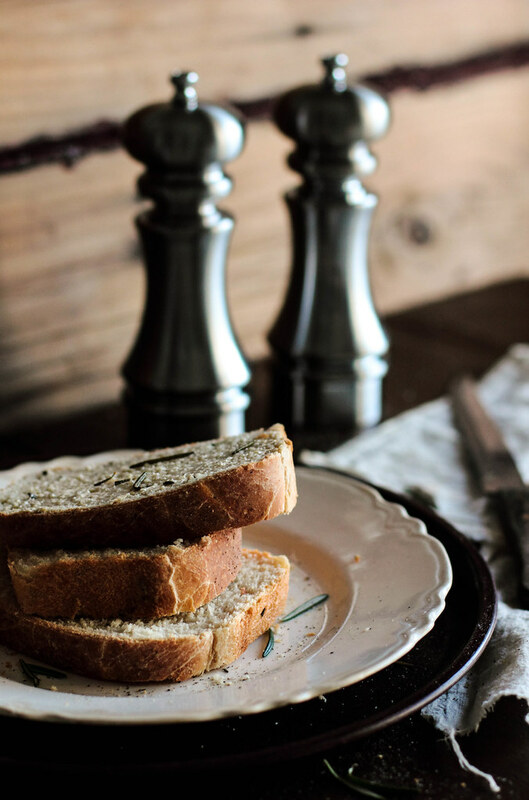 With the addition of salt, cracked pepper, and olive oil, this simple bread became a handsome marriage of flavors. For the last week, I've been enjoying this bread, savoring it slowly, finding a new love in the cracks and crevices of the grain. 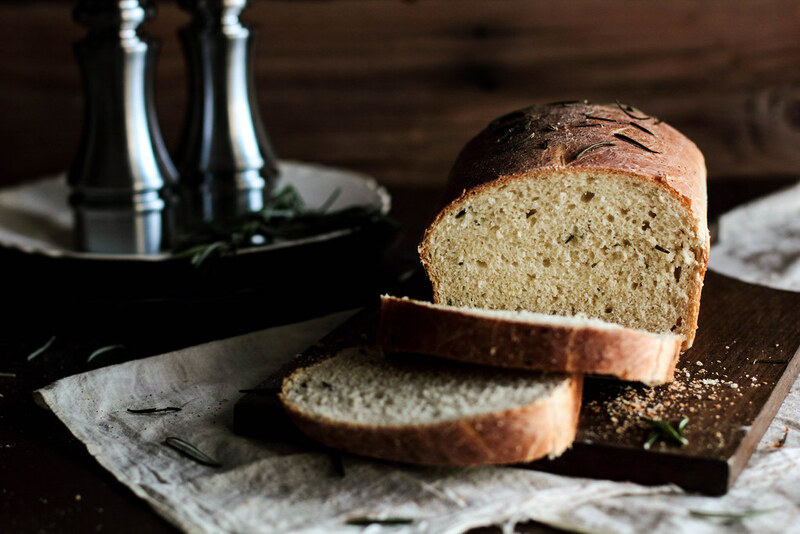 At first I wasn't sure what the Rosemary Sandwich Bread would work well with, but after a little dabbling, I discovered it is divine with nearly everything, elevating simple sandwiches to an entirely new level. I served it aside chicken noodle soup, combined with chicken and bacon to form the best toasted sandwiches, and I imagine it would be glorious soaked in mashed potatoes and gravy. I've spent so much energy in the last two days willing the bread to reappear after the last slice was gone that I've vowed to make it again this weekend (and for many, many weekends to follow). 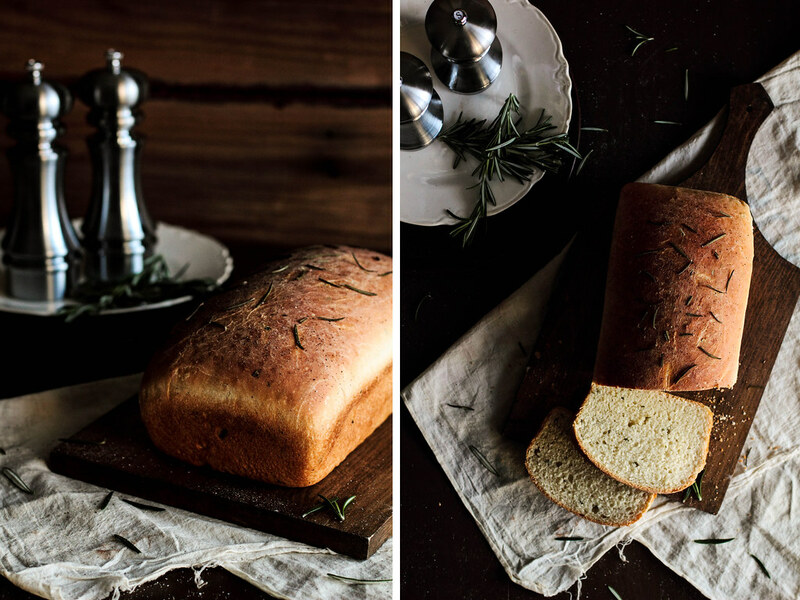 Rosemary Sandwich Bread is a Mediterranean twist on the traditional loaf of bread. 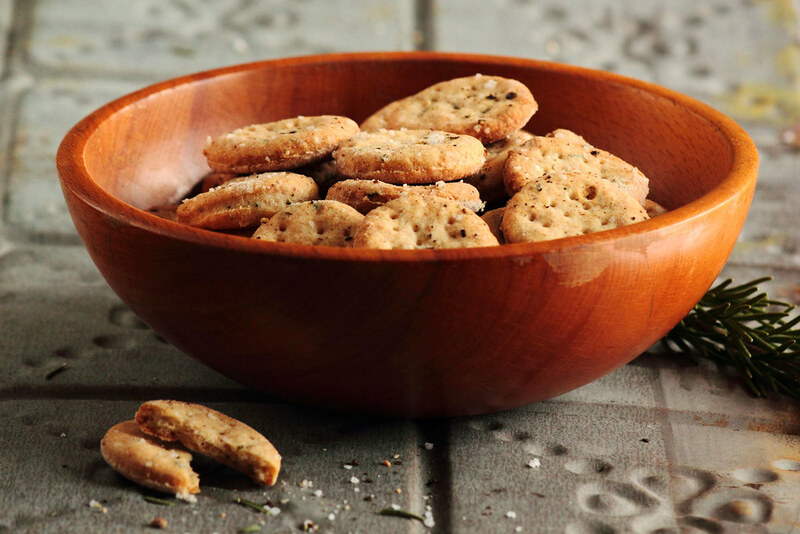 The final product is herbed and salty, balanced with the rich, smooth undertones of olive oil. This everyday bread has bright flavor that will go well with anything from breakfast to dinner. I strongly suggest using fresh rosemary in the bread to bring about the most vivid flavor, but dried rosemary will work in a pinch. This bread has become an instant favorite in my household and may soon become a kitchen staple. The thermometer sitting out on the snow-covered deck is incorrect; the needle always pointing to a temperature that stands to be a little too good to be true. Having stood out of the window for as long as my memory can trace, it is an old soul, surviving the chill of winter and the high heat of summer without complaint for decades. I like to imagine the thermometer has become an optimist in its old age, telling me the temperature I long to see while protecting me from the stark reality of winter temperatures. Right now the thermometer tells me it's a balmy 60° F. The floorboards of the deck are obscured by hard ice and crackling snow (such a temperature certainly cannot be true), but the fabricated temperature still plays up my warm weather fantasies. With the sun arising earlier each morning, lending natural light to accompany my breakfasts, I think my winter blues are nearing their end. It feels like the end to the dark winter season—the sun has finished hibernating and is rested enough to spend the day dancing across the sky. Even so, there is still a winter chill in the air and the first signs of spring are far from arriving. The warmth and heat from the oven is still welcomed in my home. The past weekend I set out to make and bake crackers. Though I've made them once before, I wanted to tackle a new set of flavors and textures. 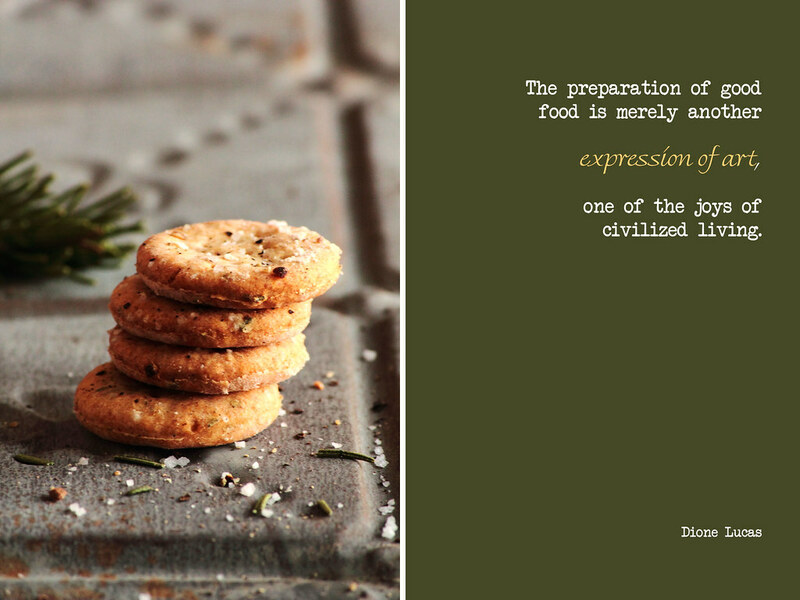 Crackers, if you may not know, are easy to prepare by hand or machine, with the act of rolling out the dough taking up the most time. Boxed crackers pale in comparison to the homespun version, as is often the case with anything bought that can be made homemade. 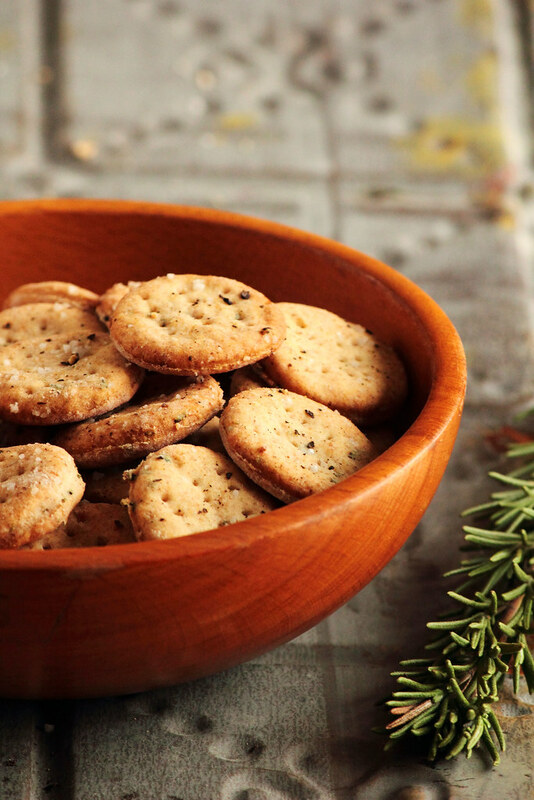 Rosemary has quickly become one of my favorite spices, with its earthy tones and bright green shade. I enjoy it both in winter or spring, which is perfect for me since the winter weather outside my window never quite matches the spring temperatures listed on the thermometer. 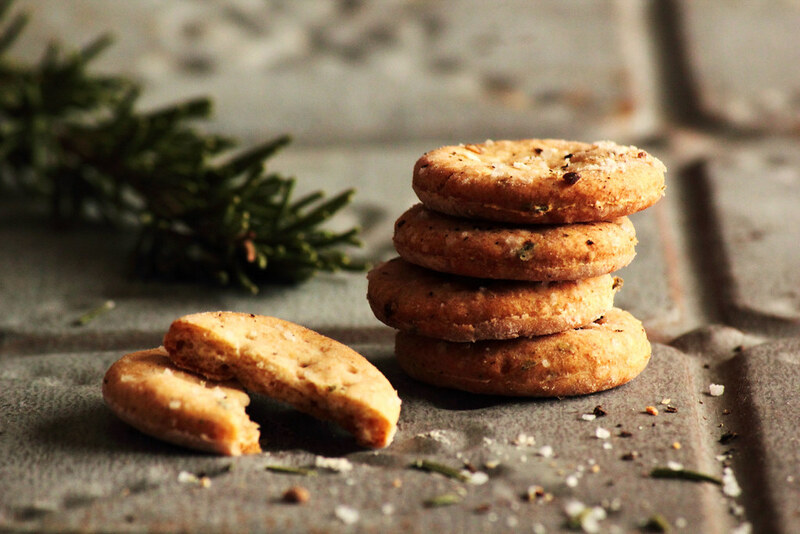 These Rosemary Sea Salt Crackers have a crunchy exterior with a soft and tender interior, mimicking the coveted texture of a perfect chocolate chip cookie. 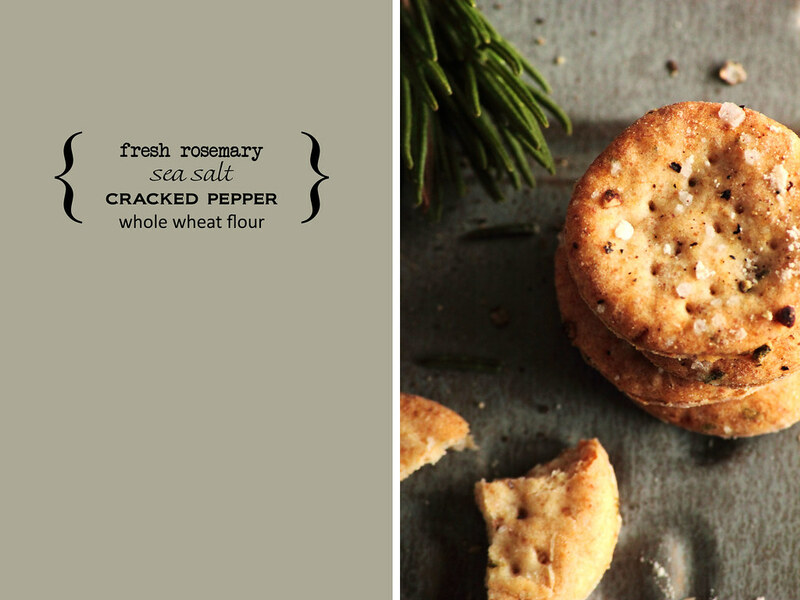 Made with a mixture of whole wheat and all purpose flours, the crackers are flavored with fresh rosemary, cracked pepper, and coarse sea salt. 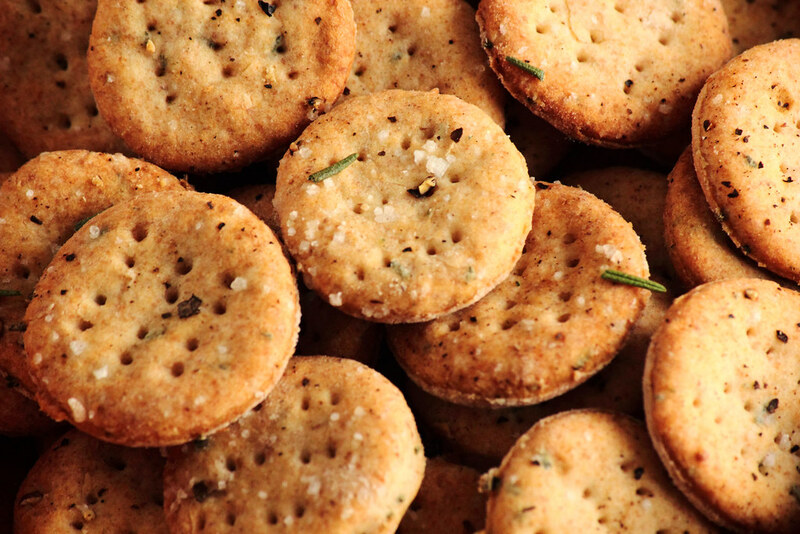 These salty crackers truly pack a punch of flavor. While they would shine with a wine and cheese tray (and impress those lucky enough to give them a try), I ate them plain and by the handful. These crackers didn't last more than 5 hours in my home.